These are a few extraordinary historic shots of the valley. Click on them to get a full-screen view. 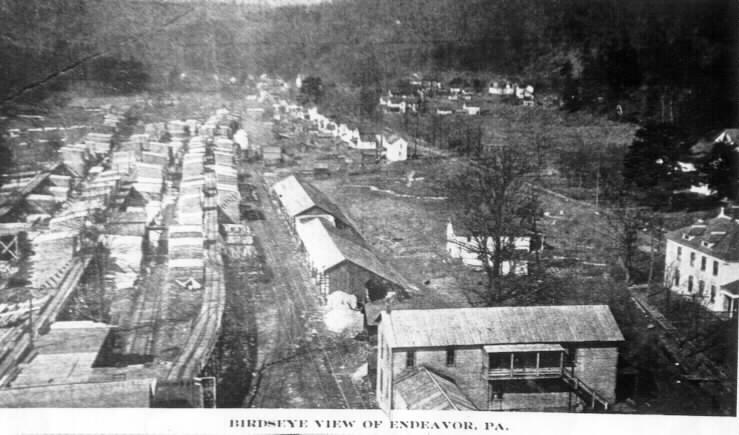 "Birdseye View of Endeavor, PA". This is from an old postcard, source unknown. 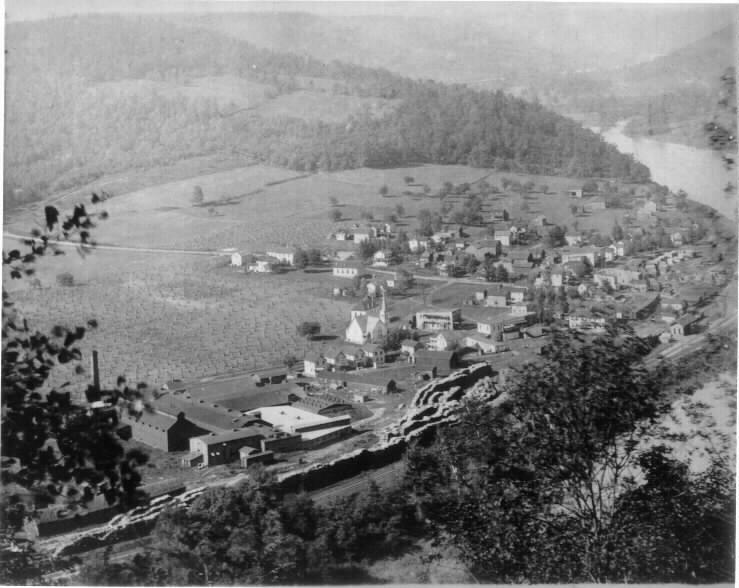 It looks from the lower mill down the valley looking toward East Hickory. You can see the W&D office, G.A. Stiles Store (no longer there), loading sheds (that are there today) and the incredible length of the sorting and drying stacks along the railroad tracks. An unknown locomotive is under steam. Judging by the fact that "gingerbread" was still on the office roof - this appears pre-1900. The homes along the road (now Rt. 666) are still there today. Possibly taken from the mill smokestack. This shot "almost" looks like it was taken the same time on the same day, rotating slightly to the photographers right (north). 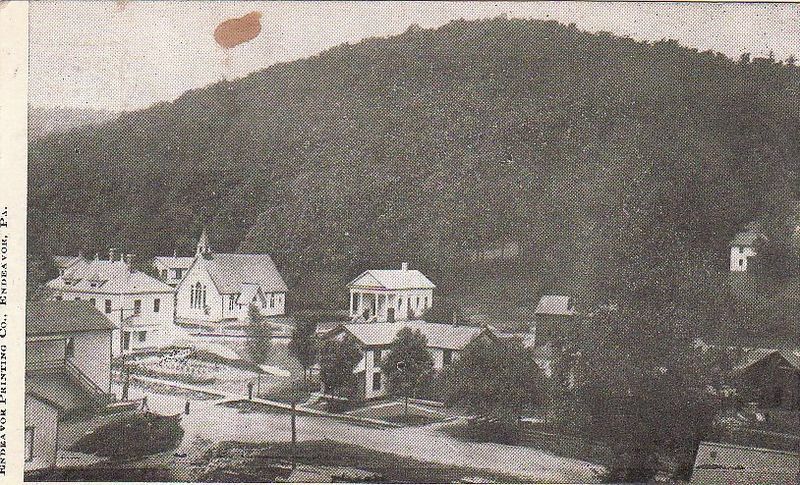 You can see buildings that are no longer there, primarily the boarding house. GA Stiles store is on left. Again, possibly taken from the mill smokestack. West Hickory, PA, as seen from the southeast side of the Allegheny River. This undated, uncredited photo may have been taken by Everett Borg. I have the original negative. You can see the PRR station, the W&D lumberyard, the entire community, and the tannery. The bridge is just out of sight on the right-hand edge. As there are no automobiles anywhere, and the boxcars are all wood - a guess might be 1915. Few clues remain today. 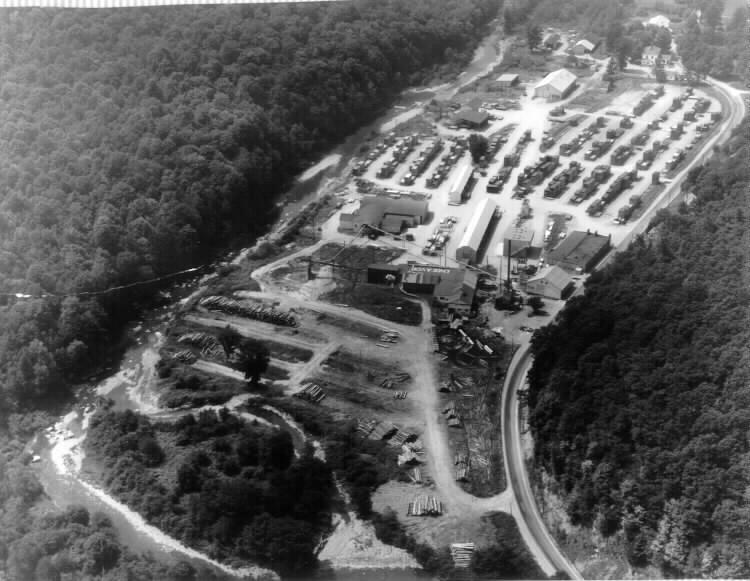 Endeavor, PA - about 1955. This is the original Endeavor Lumber Co. mill that was built on the site of the W&D mill. The W&D lower mill log pond was filled in for the storage yard. The office, shops, store, boilerhouse, log pond, and church are all original W&D buildings that are still there today. A modern mill (see modern-era views) is on the same spot today. Photo from Russell J. Gustafson.